Like most things in America, the size of our homes is expanding. According to data collected by Zillow, the median size of a detached single-family home has grown 24 percent since the late 1990s (from 2,100 square feet to about 2,600 square feet). The trend isn't surprising. After all, bigger, better, more is part of our national identity — along with reality TV, free refills, and sweatpants that look like jeans. However, if you're thinking about buying a bigger home, proceed with caution. The added expenses go far beyond a steeper mortgage. Here are the extra costs that come with a bigger house. There's usually a correlation between home size and home value. And since more valuable homes are assessed higher property taxes, expect to pay more. While tax rates vary by jurisdiction, most homeowners pay about 1.2 to 2 percent of the property's assessed value in taxes each year. 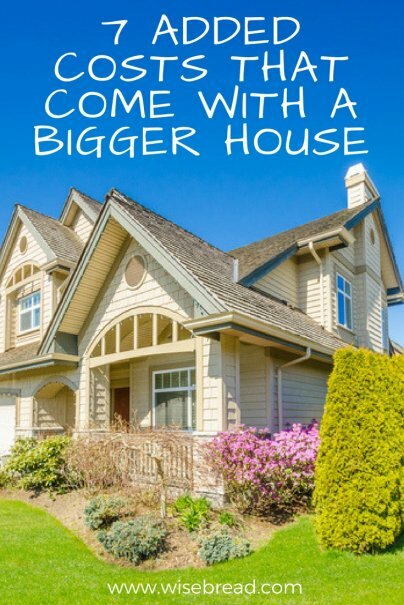 Larger houses are usually situated on larger lots, and that equates to higher landscaping and lawn care bills (or more time and more tools if you do it yourself). Additionally, maintaining a larger home can be more expensive — think more rooms to clean, more windows to wash, and more exterior surface to scrape and paint. Be ready to commit a significant portion of your days or your dollars to keeping the new place looking sharp. Unless your style is "empty chic," more house means more square footage to furnish and decorate. Artwork, window treatments, rugs, sofas, and beds (oh my!) — they can all add up to a few thousand dollars in no time. A curious thing happens when people move into larger homes: It's expected that they'll entertain more, host holiday parties, and serve as the hub for every family gathering. All that merriment costs money. Whether those ballooning expectations are internal or external, plan on adding a few extra bucks to the "entertainment" column of your budget.